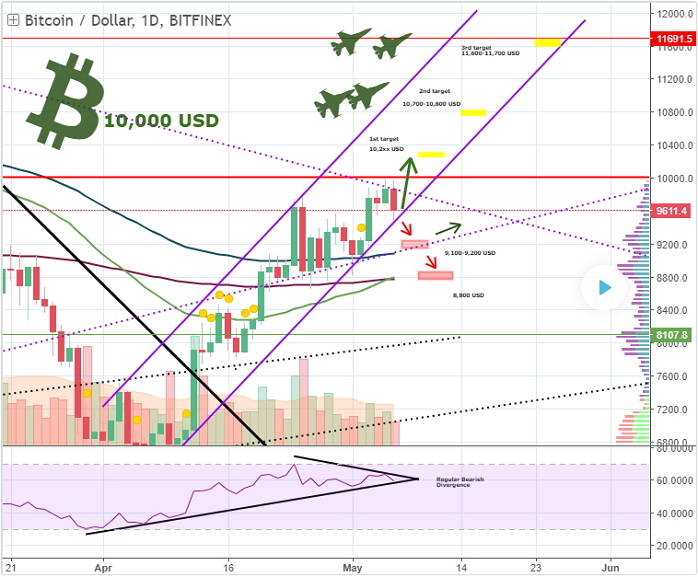 Market Leader : News :: Will Bitcoin Rate Exceed $10K This Week? Will Bitcoin Rate Exceed $10K This Week? This week, the BTC exchange rate may well break above 10000 USD/BTC, most of the experts interviewed by PRIME think. The previous trading weeks happened to be bullish for the world’s first cryptocurrency. Some exchange rate the BTC at 9900 USD/BTC. If the rally preserves this week, we may well see the price move and consolidate above the $10K threshold. If that’s the case, the BTC market will get a new one – $15K. But before that, the digital currency will have to overcome another level of resistance, which is $11K. At the same time, NordFX experts report that the current Bitcoin rally has been in progress for 4 weeks. Since early April, the exchange rate has moved from 6600 USD/BTC all the way up to 9500 USD/BTC. Overthepasttradingweek, itgained 3,2%. So, the overall market sentiment is bullish for the global market of cryptocurrencies, which allows international analysts to go bullish on Bitcoin and some altcoins. However, some experts warn that the rally may well end in the near future. For example, NordFX experts assume that investors may well lose interest in Bitcoin if it moves below 9330 USD/BTC.